This is a continuation of our new series on the Popes, starting from the beginning and working to today, attempting to separate fact from fiction and fleshing out interesting details about these individuals’ lives. Check out more in this series here. To say that the history of the early Roman Catholic Church isn’t well known would be an understatement; in fact, so poor are the records from the 1st century that no one is exactly sure who some of the popes were, or even when they ruled. 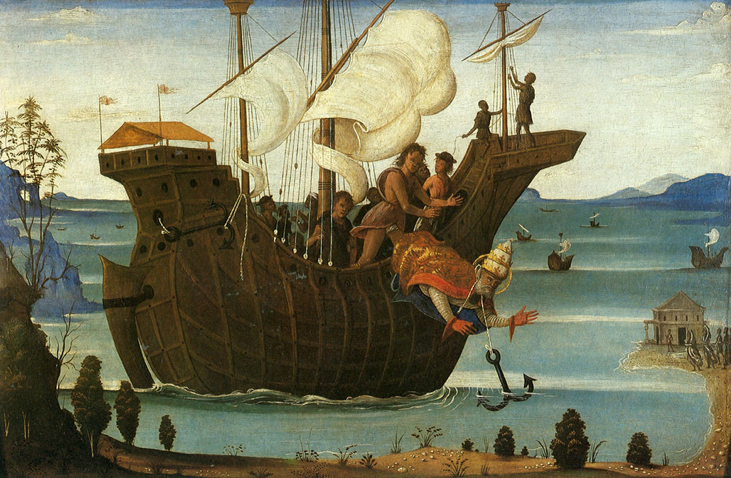 For years, some ancient scholars believed that Clement was St. Peter’s successor, while others claimed that Linus was. Adding to the confusion was simply the identity of another (or two other) of these early popes: was the name Anacletus or Cletus, were they actually the same person or two, and regardless, in what order did they preside over the Holy See? Today scholars have agreed on a set order of the popes (whether due to actual evidence or just because they tired of the bickering is unclear…), which corresponds to that provided annually in the pontifical yearbook, Annuario Pontifico. This list begins with Peter, followed by Linus and Anacletus (no Cletus), and then Clement I. Unlike some of these early popes, there is historical evidence of Clement’s existence. In St. Paul’s letter to the Philippians (Phil 4:3), Paul describes Clement as having “struggled at my side.” In reliance on this, many scholars believe that Clement was instrumental to Paul’s evangelistic mission to the Gentiles. In times passed, some have claimed that this Clement was actually Titus Flavius Clemens, a nobleman related to the Caesars and a nephew to the Roman Emperor Vespasian (rules 69-79 AD). Like Clement I, he was executed for his religious beliefs, and even has an inscription describing his martyrdom carved into the stone underneath the church of St. Clement in Rome: “T. Flavii Clementis Viri Consularis et Martyris Tumulus illustratis.” Despite this, however, most scholars doubt that Flavius Clemens was, in fact, Pope Clement, believing the latter was of Jewish descent. According to some sources, Clement was named by St. Peter as his successor but initially declined the honor, allowing Linus and Anacletus to serve before him. These authorities hold that since many in the early church were not inclined to follow Peter’s authority, being of a “mild disposition,” Clement, at least at first, was loathe to try to impose any authority himself. Nonetheless, he eventually became pope, and one of his official acts was so significant, hard evidence of it has been preserved. Part of the Apostolic Fathers writings (works that come from people who had such close contact with the Apostles that their words are said to be “echoes of genuine Apostolic teaching“), the first letter of Clement to the Corinthians (written sometime between 95 and 140 AD) includes his admonishment to some in that community who, as a result of a dispute with their spiritual leaders, removed them from their offices. The letter was widely read as part of the Church canon through the 4th century, although some scholars noted it contained three “faults:” (1) he referred to a phoenix as a real bird that was found in “Arabia and the countries round;” (2) he describes Jesus as if he were a man and not divine; and (3) he supposes other worlds beyond the ocean. Interestingly, for centuries during the so-called “Dark Ages,” (see: The Dark Ages: How Dark Were They Really?) all traces of this letter were lost until 1633, when the librarian for Kings Charles I and James I of England (also James VI of Scotland), the Scotsman Patrick Young (Patricius Junius) got his hands on an ancient copy of the Alexandrian LXX. By the 3rd century AD, Egypt had a large population of Jewish people who were not fluent in Hebrew, and, therefore, needed to have their scriptures translated into Greek; prior to the LXX, bad translations abounded, so to remedy the problem, Ptolemy Philadelphus arranged for 70 scholars (hence the name) fluent in both Greek and Hebrew to prepare a proper translation. One-hundred years later, the leader of the Church in Alexandria, Athanasius commissioned Thecla, a noble Egyptian woman whom he trusted, to oversee transcription and copying of the LXX, but the book remained there until the Patriarch of Alexandria, Cyril Lucar, sent a copy to England in the early 1600s, where it was ultimately revealed by Young. Of course, the story of the long journey of Clement’s letter pales in comparison to two of the fables about the latter part of his life. Near the end, Clement was banished by the Emperor Trajan across the Euxine Sea (Black sea) to Chersonesus (Crimea) where he is said to have saved the people from dying of thirst by causing “a fountain to spring up miraculously for the relief of the Christians.” As you can imagine, this impressed the other local people, who all immediately converted and built 75 churches across the peninsula. On the anniversary of his death, the sea retired to the place where he had been drowned, though three long miles from the shore; that upon its retiring, there appeared a most magnificent temple . . . in which was found the body of the saint . . . . Although this was said to happen each year thereafter, with the sea remaining at bay for a week each time, there are no recent reports of it. Rather, in the 9th century, St. Cyril, while travelling in the Crimea, supposedly discovered some bones together with an anchor in a burial mound. He declared them the remains of Clement I, and had them placed in the high altar of the basilica of St. Clement in Rome. The Septuagint, or LXX, was NOT translated from Hebrew to Greek in 300 A.D. It was translated in 300 B.C. That’s six hundred years earlier than you say. Which is why, in the New Testament, when Jesus and the Apostles are quoting from or referencing the Hebrew Scriptures, the authors of the New Testament books (which are all in Greek) quote from the then-well-respected and long-existing LXX translation of the Hebrew Scriptures instead of making up their own Greek translations straight from the Hebrew. Of the 383 quotes or near-quote-allusions to the Old Testament which are found in the New Testament, all but 33 of them match the Septuagint translation. Oh, and by the way, Athanasius’ commissioning of Thecla was in (about) the year 400 A.D. But that means it occurred, not 100 years after the writing of the Septuagint, but about 700 years after. Many Christians know precious little as it is about the origins of the canon. But we don’t want to make the matter worse by having the order-of-dates become completely unintelligible.